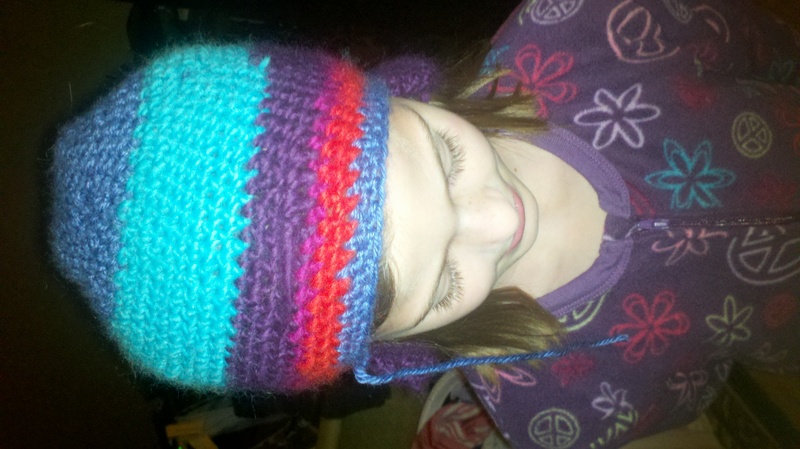 Irony of ironies….I’ve spent the weekend cooking and this evening knitting. Of course, this is not unusual for me. The weekends around here include all things home….cleaning, cooking, spending time with the girls, hanging out, knitting…ect. None of this could be considered ironic or even odd, except that I’ve been thinking about my sis in France over the last few days, a lot. I was getting ready to post my photos of dinner tonight and my new knitting project, when I just realized that my new favorite cookbook is named Around My French Table and the pattern I just started, Wrenna, is from a book called French Girls Knits. 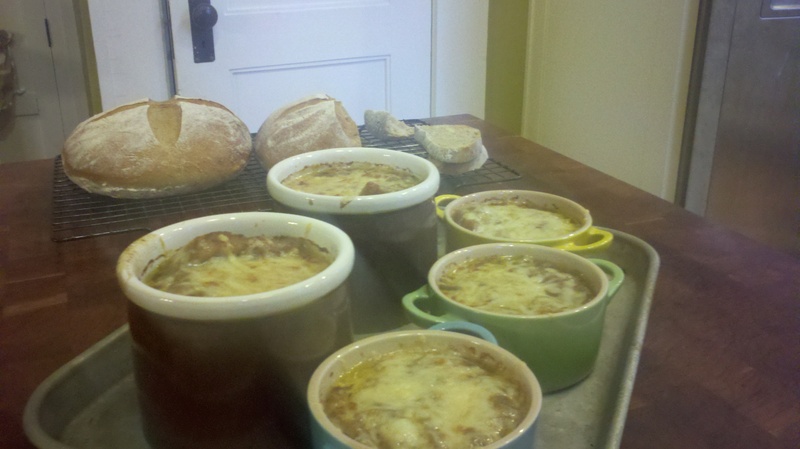 Oh, and I forgot…I made French Onion soup for dinner yesterady!! 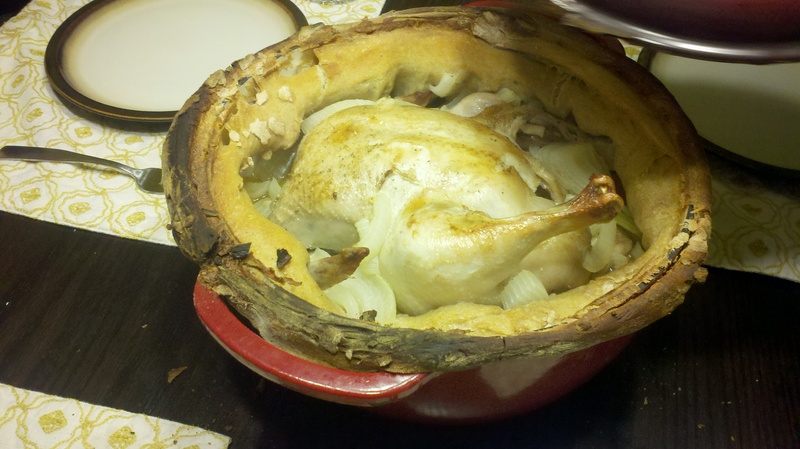 The recipe for the Onion soup was in the same cookbook. 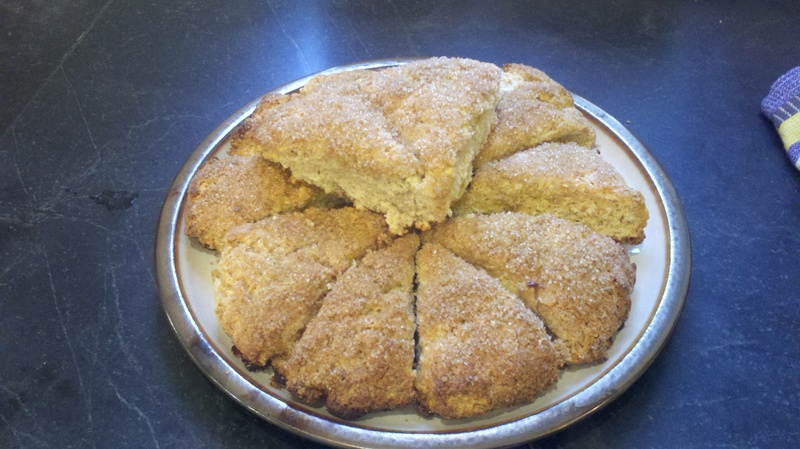 I also took a photo of the left over scones I made Saturday morning. Some friend of ours moved from here to Decatur, GA this summer. Thier youngest was best buds with our oldest. So, we had them over Saturday and invited the girls from Grey’s class. I made three batches of scones for us to nibble on and made a fourth batch to take to our new neighbors about five houses down. Henry and I have appointed ourselves the unofficial welcoming committee on our street. We may branch out into the neighborhood…just depends on my baking keeping up with the moving! Anyway, out new neighbors are actual a family from our girls school.. We are so excited to have them. The number of children in our neighborhood seems to be growing. I am very excited for the girls. 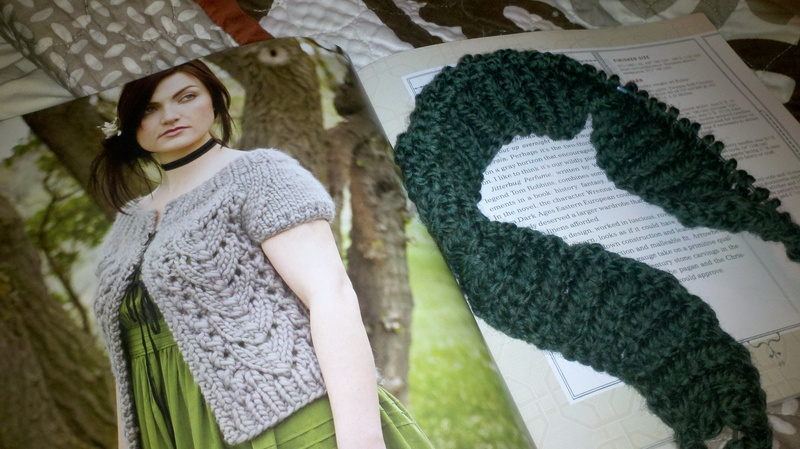 Here’s a photo of the dinner and a photo of the knitting. By the way…notice all of those pears?! My Aunt Nancy brought them to us. There is about 3 gallons of them. 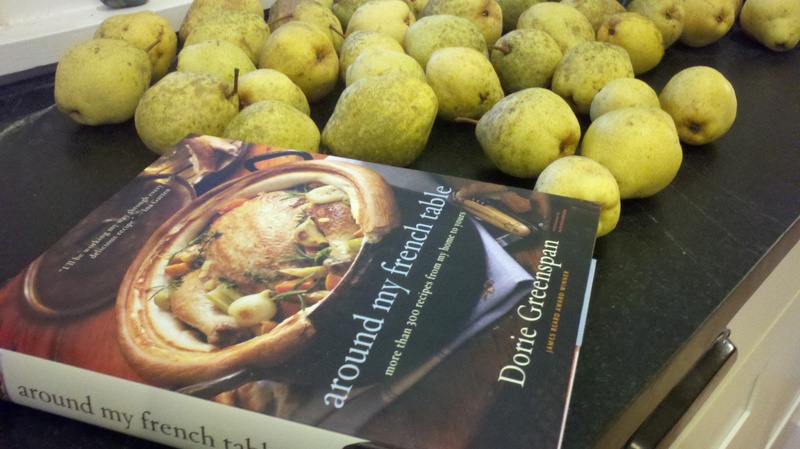 I plan on making a pear and port compote to can. It sounds like autumn so much, I can’t resist. I am imagining serving the compote with turkey this Thanksgiving. Becca, I wish you were going to be here. Maybe I can ship a jar of compote. I am not going to do knitting for the K post because that is too predictable, especially from me. 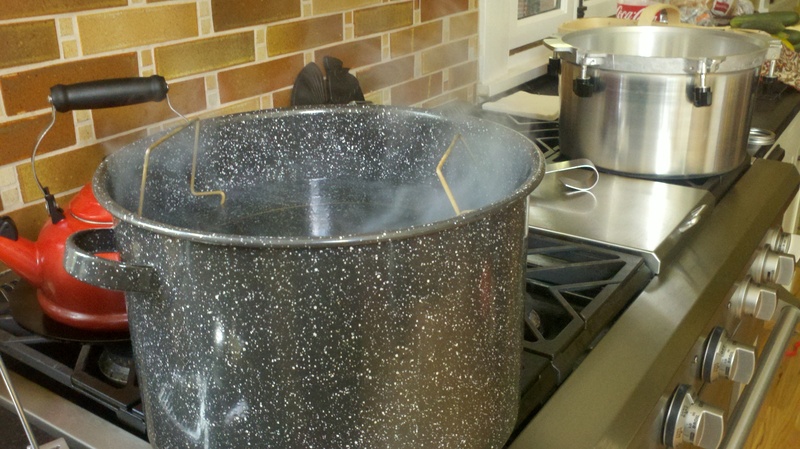 So, I cheated a bit and I am going to do canning for K since at least the first letter sounds like a K. It’s my blog and I reserve the right to do as I please ;-). 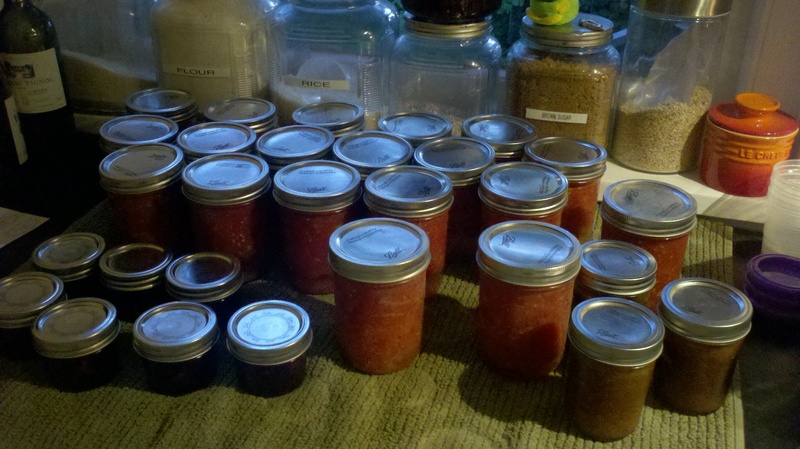 Anyway, I have been canning all weekend…by that I mean 12 hours a day on Saturday and Sunday. This is my first real go at canning. I am starting this year because for a while Henry and I have really been interested in where our food is coming from and what goes in it. In early spring we decided that we were going to take down a few trees, build a retaining wall and have a really big garden. It is not finished as it was a bigger undertaking than I first thought, but it will be ready for next year. I decided to stick my feet in the canning pool this year using vegetables that someone else grew. We have a really good farmers market in Nashville, so I made a trip last Friday and stocked up on some in season favorites and supplemented with some items that were regional like peaches, as well as some things that are a little further afield…lemons. 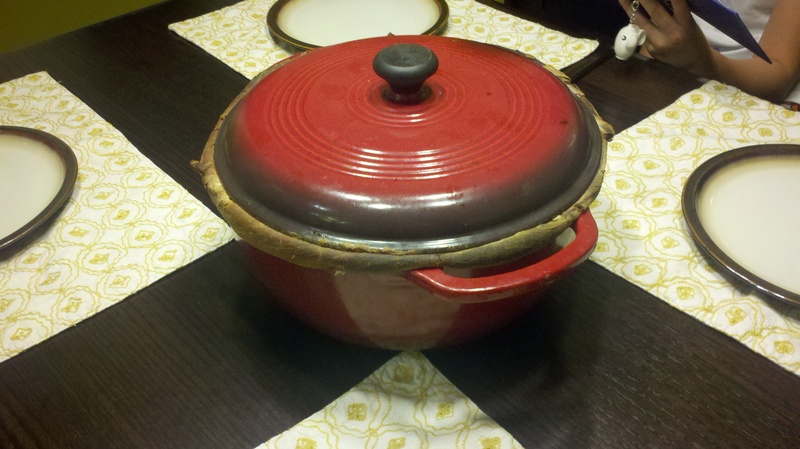 My mom let me borrow my grandmother’s water bath canner and a bunch of canning books. I also bought a pressure canner because I knew some things we would want were not acidic enough to be safe in the water bath canner. I made lemon curd, peach salsa, peach and almond jam with thyme, red pepper jelly, tomatoes and preserved lemons (salt preservation, no canning for it). I have to say that while it was not the easiest thing I have ever done, it was not the hardest either. I do think it is going to prove enjoyable and very, very satisfying and will get easier as I develop a system. The only real issue I had was something called “siphoning.” This happens when the contents of a canned item migrates from the jar into the pressure canner. 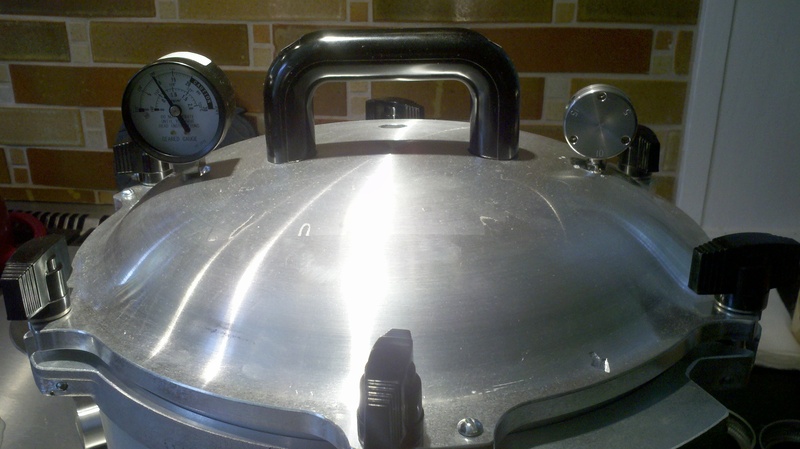 This happens when the pressure changes too rapidly….the pressure changed too rapidly in my case because I failed to read the part that suggests leaving the items in the canner for five minutes after the pressure returns to zero and after you have removed the vent weight. Live and learn…I had to reprocess the lemon curd. now, the taste did not change, but the color changed significantly. 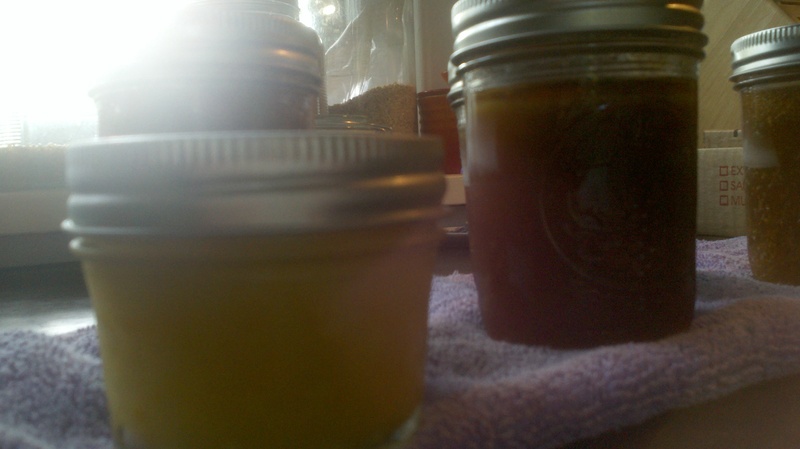 The lemon curd was a beautiful sunny yellow until the second run through the pressure canner…now it is a muddy brown. 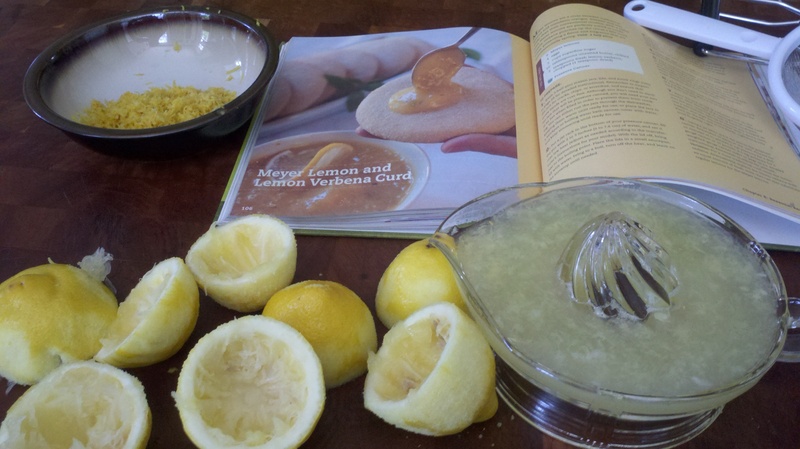 I have photographic proof of all of this activity below….even the mud brown lemon curd. We have already been into everything and found it to be well worth the effort. I know it will be doubly worth it this winter when we can relive the glory days of summer through food. I have so many things to be grateful for this week. As you may have noticed, I missed “G” last week. We were in the Blue Ridge Mountains in GA with our best friends and their twins. I have a number of photos to show you as proof positive that I have so much to be grateful for. I’m grateful for a husband who is a better partner than I deserve and who is the father that the girls need; for my beautiful girls who find everything exciting and fresh; for my dearest friend who lets me be crazy while all the time gently nudging me toward a saner place; for two amazing 15 year olds who are excellent role models and friends to my girls; for my hubby’s best friend who is always there; and last, but not least, my snuggly bed, two cuddly cats and a cup of Earl Grey with my favorite cookies before bed. 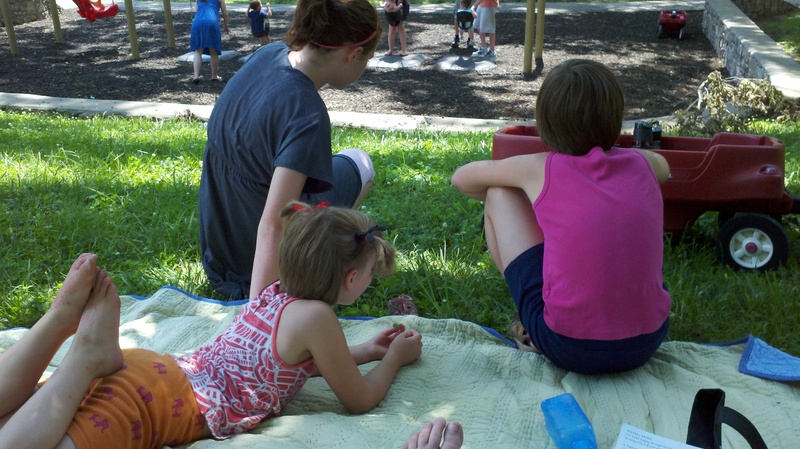 It seems as if one experiences an endless parade of “firsts” when becoming a parent. There are first steps, first words, first smiles. 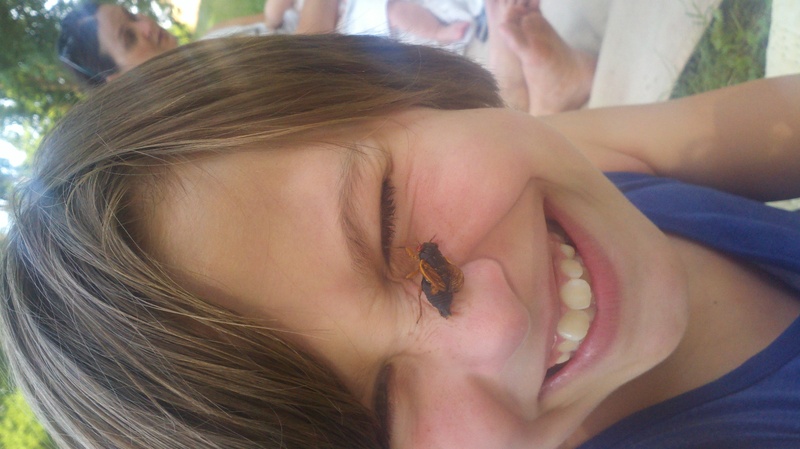 Then life happens and we forget the everyday firsts we experience with our children. I was looking through my recent photos for inspiration and found numerous pictures of our girls. I realized that those everyday pictures are even more precious than I thought. 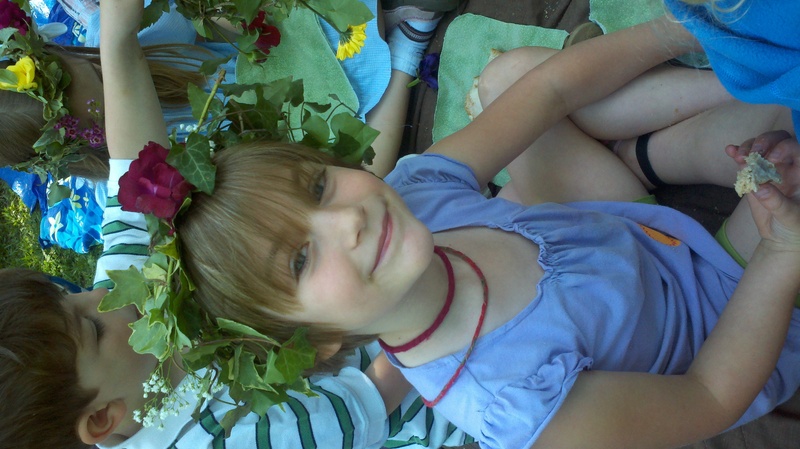 There are pictures of Grey and Mycah’s first ever May Fair at their amazing school. 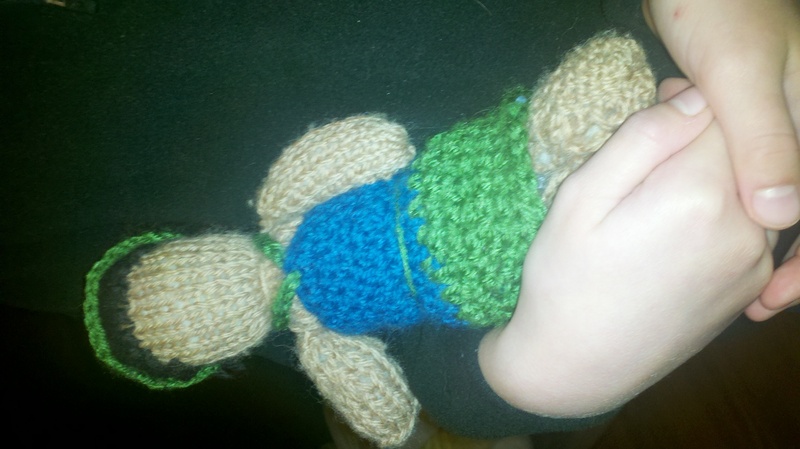 There’s a picture of Grey’s first crocheted hat and her first knitted doll (with crocheted clothing), both done at aforementioned amazing school. 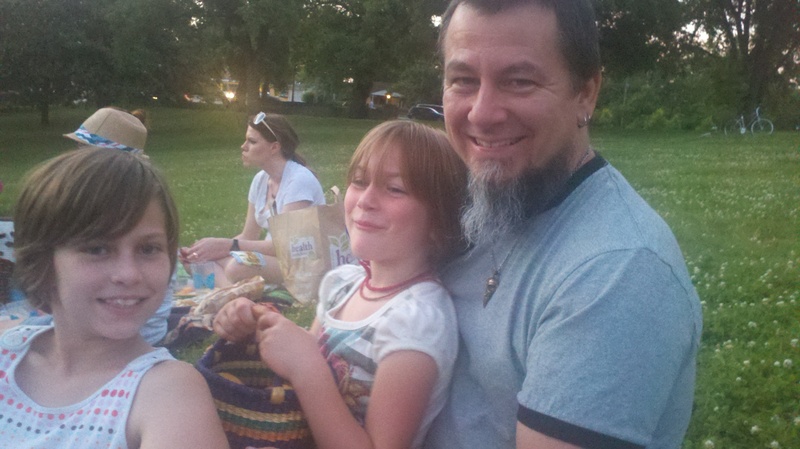 Our picnic with Zoe at the park (ok, I admit, not the first of the season and certainly not the last…but give a girl some poetic license, k) And lastly, there is a photo of my first time sitting knee to knee with my friend Camille embroidering names on the apron for Mycah’s teacher. I am almost finished with the apron. 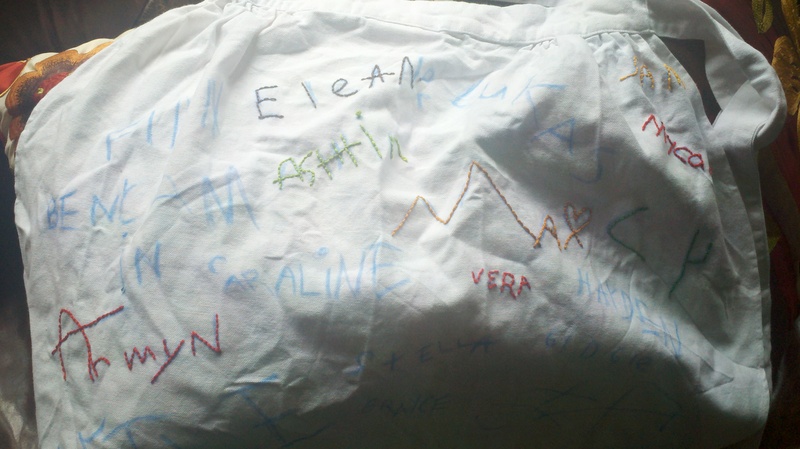 I have embroidered all the names. All I have left is to embroider “Morning Glory” on the waist band and the Linden School’s symbol on the upper left of the apron body. I have to say, i have been slogging through this last portion an d stealing time to do other things. I have knit a pair of newborn booties http://www.ravelry.com/patterns/library/stay-on-baby-booties-5 from a Churchmouse design for the yarn store I work in and I cast on a pair of clog socks http://www.ravelry.com/patterns/library/turkish-bed-socks for myself (also a Churchmouse design). 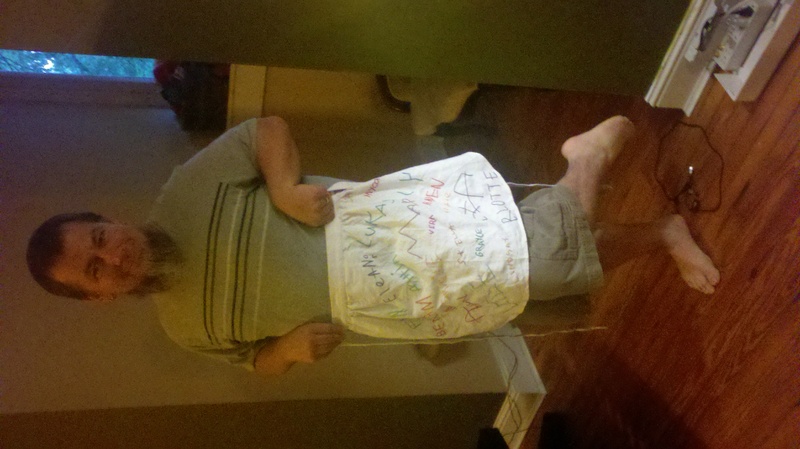 Here’s a picture of my husband modeling the apron…he’s a little silly at times. Craft is both a noun and a verb. The noun craft means, among other things, a skill or ability, especially in handwork. The verb craft means, among other things, to make or fashion with skill. In college while working on my BFA, majoring in metalsmithing and minoring in sculpture, I had a tenuous and stressful relationship with the notion of “craft.” In the academic context, “craft” was second tier due to the utilitarian implications of a craft, such as jewelry making, ceramics, fabric arts, etc. It seemed the only way to legitimize that kind of handwork was to turn it on its head. Even then, irony reigned supreme when dealing with “crafts.” On the other hand, my sculpture professor railed about the lack of craftsmanship in some of my peers work. Craft has forever been a word loaded with meaning for me. Today, I have allowed myself a little more freedom and take a little more comfort in using the word craft. I think I prefer craft as a verb and the definition of “to make something with skill.” Arguably, not everything I do is with the skill of an expert, some may say none of what I do is expert. Here are some of the thins I have been crafting this week. not all of them were perfect, but they were done with love and a sincere commitment to doing the best I could at the time. This is a wall organizer I hacked for my husband. Henry looses his keys, his wallet and his phone on a daily basis. I decided that he needed a place to charge his phone, stash his wallet, camera and keys that could live at the front door. I knew I wanted it to hang on the wall so it was not more clutter on the table. 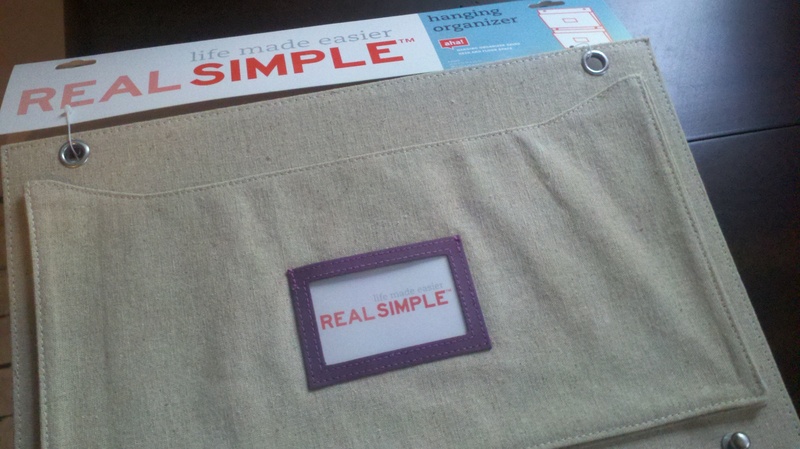 So, I found these Real Simple wall pouches. I really liked them other than the bland canvas. 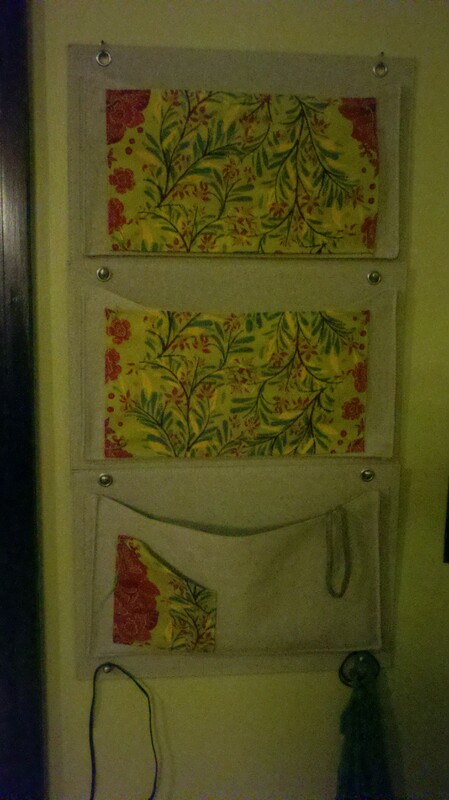 I jazzed them up a bit with some Anna Marie Horner fabric http://store.annamariahorner.com/ . 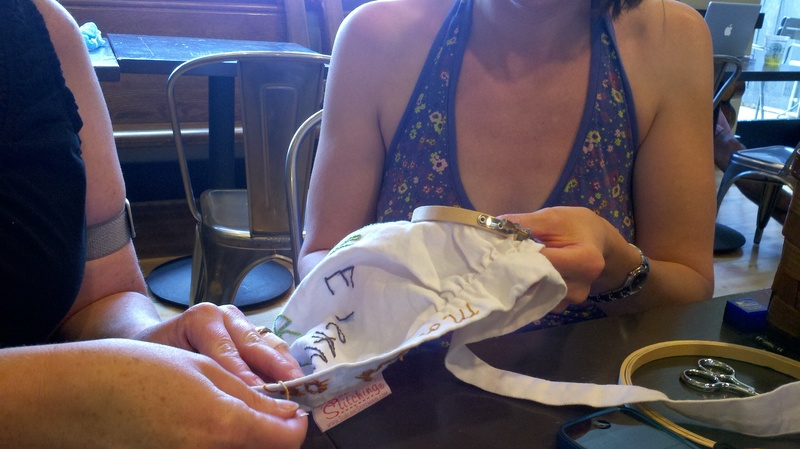 (Nashvillan, by the way) The little pocket is for his cell phone and enables him to plug it in for charging and hang it! He really likes it and i am really happy I have crafted up some piece for me and him…now I don’t have to nag and he doesn’t have to stomp around looking for his phone! 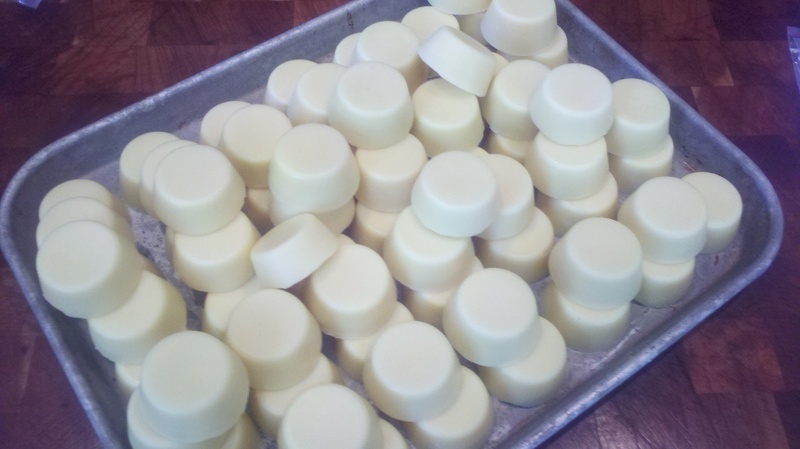 These are lotion bars I crafted with my friend Aziza. We are trying to get a little cottage business started. we are currently focusing on finding the best organic ingredients, perfecting our methods and packaging these little jewels. They are beeswax, cocoa butter and shea butter. They smell so good and have no fragrance at all. Our little lotion bars are more than just lotion bars, they are the product of a couple of women crafting a friendship. This little picture is terribly hard to see, I know. But, trust me, it is one of my most favorite things I am currently crafting at the moment. 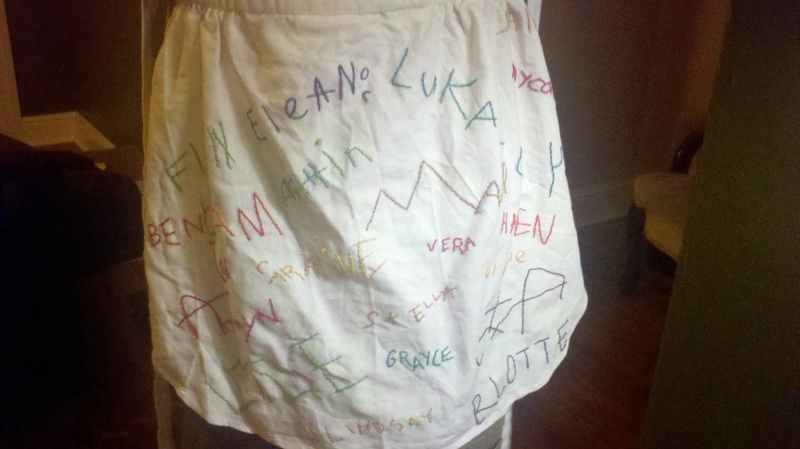 This is an apron for one of Mycah’s teachers. Another mom, my friend Camille, is making one just like it for the other teacher in the class. Mycah is in a mixed age kindergarten. They are 4, 5 and 6 year olds. We had them write their own names on a piece of paper and then laid them out in a pleasing composition and transferred them tot he aprons. We are now embroidering each child’s name. Each little name I embroider causes me to think of that little person. The handwriting even looks like each child. Mycah’s teachers are amazing women and I hope that the little imprint each child left on this apron will remind them of the love those children feel for them. 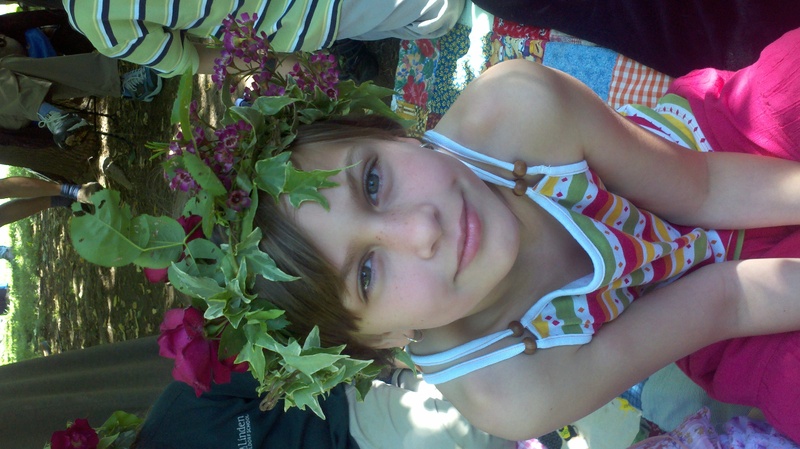 Camille adapted this idea from Amanda Soule’s book, the Creative Family. http://www.soulemama.com/ Amanda embroidered her children’s drawings onto linen for simple, beautiful bookmarks. I thought this was a great adaptation that Camille thought up and cannot wait to finish it so the teachers can enjoy them. The last set of pictures is from my most important and ongoing project…my family. Henry and I spend a good deal of time crafting our lives and those of our girls’. Growing a family is a craft, a skill on is not born with and one that no one tells you how to do. 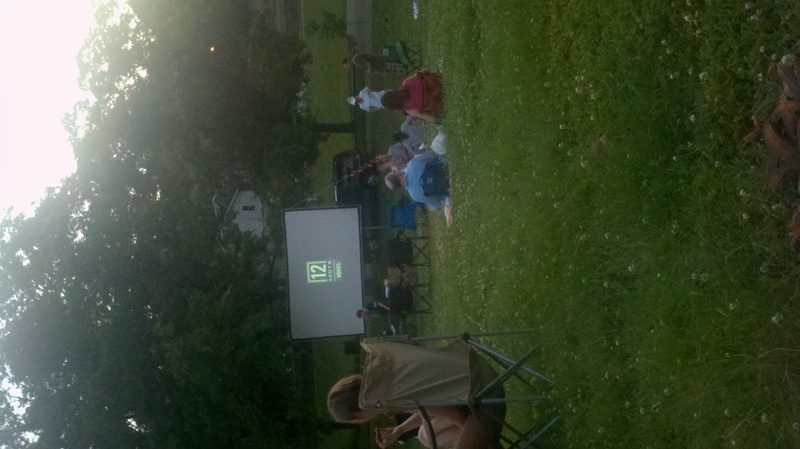 This was Saturday night a tour first neighborhood movie in the park night. We walked the 2ish blocks to the park dragging our trusty and dilapidated red wagon filled with a blanket, bug spray, glow sticks and snacks. The movie of the night was The Goonies. It was an amazing night, one well worth the effort, just like any fine craft! For better or worse, I have decided to join the The ABC’s with the Accidental Knitter. http://accidental-knitter.blogspot.com/2011/05/learn-your-abc-new-meme.html This is a once a week posting theme based on the ABC’s. We will post a topic beginning with the week’s letter of the alphabet every Monday. I have been looking for a way to get back into to posting and I am hoping this is just arbitrary enough to suit me. We were supposed to start last week with A. Obviously, it didn’t happen. So, I will post A tonight and hopefully put up B tomorrow. I have a ridiculous backlog of photos, projects, stories, etc. 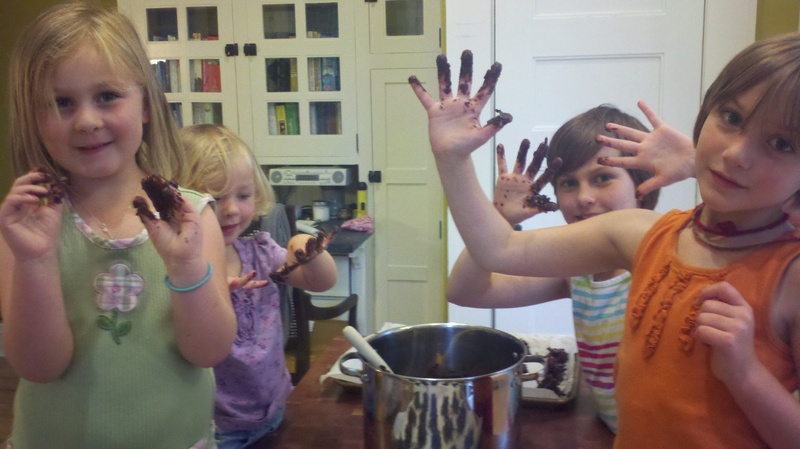 I just felt compelled to link the Might Be Giants song Alphabet Lost and Found because it is so cute and it starts with A.
Here’s a cut picture of Allison’s two littlest and my two making some no bake cookies. Henry and I took Allison’s oldest and ours to the used bookstore today and Mycah bought a couple of cookbooks. She immediately began pouring over them and located a simple recipe that we could make with many hands!